Usually, I only review survey sites here, but I have gotten a few emails from our readers wanting me to review Ebates and talk about whether or not it’s a legit cash back site. Most consumers are aware of internet related scams. And we can usually tell when something is too good to be true. Unfortunately, there is no shortage of scams and sites that scam people online. And we can usually tell when something is too good to be true. Of course, it would be inappropriate to label all these sites as a scam, especially considering that many of them, like eBates, have shown to be trustworthy and legitimate. Ebates.com is one such cash back shopping website that is quite open about its working and the way it makes money and how it’s able to pay cash back to its users. I have been a member of the site since 2008. In this Ebates review, I will cover everything there is about this cash back shopping site, whether it’s a scam or a legit site, how much money you can make, and whether or not it’s worth your time. During 1998, two Deputy District Attorneys from Silicon Valley founded the company. It is interesting to learn that before forming this company, the two specialized in prosecuting online frauds and identity thefts. They launched their website Ebates.com in 1999 to be the pioneers and leaders in the field of cash back shopping. In September of 20111, the company announced the creation of Performance Marketing Brands (PMB), a new company specializing in shopper loyalty programs. The same year, they also bought the other two famous cash back shopping sites FatWallet.com and AnyCoupons.com. Talk about great business strategy! Ebates.com is a rewards website much like SwagBucks.com, but unlike SB, it only focuses on online shopping. It allows its members to earn up to 25% cash back on their online purchases from more than 1,200 online stores without asking them to redeem their points, mail-in forms, or pay any fee for joining as a member. The website gets a commission when a member buys something from one of its associated stores. A part of the commission they earn is paid to the members to prompt them to keep shopping through Ebates from their associated stores. As of now, the site is mainly associated with three affiliate networks: Commission Junction, Google Affiliate Network, and Linkshare. It has more than one thousand online retailers, offering internet coupons to buyers looking for bargains. Till date, the company has disbursed more than fifty million dollars to its patrons in the form of cash back. On Jan6, 2000, the company earned accreditation of BBB and was awarded the highest rating, an A+. That ensures there are no scams going on with this company. The BBB reports that during the last two years, the site has had 74 complaints and all of them have been resolved. You’ll agree that taking consideration of the size of the company, that number is quite low. It further confirms that the company has a quick and dependable system for addressing complaints of its clients. 1. At the outset, you have to sign up. It is free, without any charge whatsoever. Additionally, you get rewarded for signing up. On signing as a new member you are offered a gift card worth $10 for a store of your choice. 2. Using the search box, look for the store you want to buy from. 3. Having found the store, just click “Shop Now” button. 4. A tracking ticket gets created for you. Now, you are at liberty to complete your purchase from the selected store within thirty days and claim your cash back thereafter. 5. After you have completed your purchase, they automatically credit your account with the correct amount of cash. As you click on the link to the store and check out from the store, within one to five days cash is deposited in your account. Then, your cash back is withheld for a holding period to ensure that the goods you purchased are not returned. After your cash back has been retained for sixty days, you are entitled to a payment. If your earnings exceed $5.01, you get your cash back amount every three months in February, May, August, and November. In case you earned less than the said amount, your earnings are carried over to the next check. 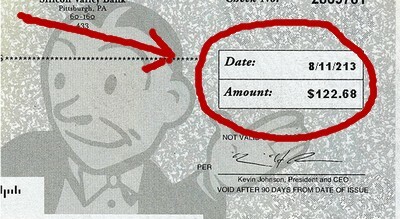 You can ask for your check through mail or get it credited to your PayPal account. You also have the option of diverting the check to a member of your family or to a charity. Just ensure that your account conveys how the earnings should be paid out. 1. 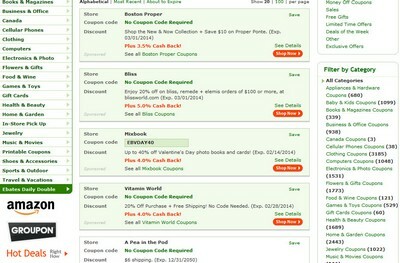 Combine it with coupons: You can enhance your savings by combining coupon codes and cash back. Let’s say at some time they were offering cash back of 3.5 % for purchasing from CVSPhoto. Simultaneously, CVSPhoto were also offering a discount of 50% on photo books. Let’s say you wanted to buy a photo book having an original price of $29.99. After deducting 50% discount, it would cost you $14.99. You also decided to order a couple of prints and the total payable amount came to $18.86. You got 3.5% cash back from Ebates. So taking into account that cash back, you would need to pay only $15.09, excluding taxes and shipping. 2. Use rewards credit cards: When you have a rewards credit card, you can further increase your cash back on using it for shopping at Ebates. That’s an excellent way to make the most of your rewards without incurring any additional expense. But, ensure that your balance is paid every month else your rewards may get wiped out due to interest charges. 3. Refer people: On referring members of your family and friends to the site, you also earn cash back on the first purchases made by them. Yes, it is. It’s all based on affiliate marketing or as its known in the offline world “the middle man” idea. Of course, there are laws regulating affiliate marketing as well. Affiliate marketing is nothing new, it’s been around for years and years. It’s a much more cost-effective way for businesses to advertise and get new customers. Instead of paying thousands of dollar for traditional media ads regardless of whether or not they get any new customer from such ads, with affiliate marketing, they only pay for people who visit their site and maybe become their customer. So, there is nothing illegal or bad happening here. You can read more about affiliate marketing and how it works here. This Is Not a Part-time Job! The idea of spending cash to save cash is motivating. Yet, it works to your benefit only when you spend money for buying some item that you needed anyway, even if it carried no cash back incentive. Cash back alone should not be the motivating factor to buy anything. People often tend to go wrong, thinking that Ebates presents a way of making money. So, don’t get carried over in anticipation of getting cash back. If the need for buying a product is already established, then only you’ll benefit by using the site and make some cash in the process. Whenever you want to earn cash back, you need to use their website or download their toolbar for the purpose of making your purchases from their associated stores. Even if you have bought something from that store in the past, you have to access that store once again through Ebates to earn your credit. It is simple – if they don’t get credit for your purchase, they can’t offer you any cash back. You should also understand that exchange or return of any product that you purchased results to the cancellation of your cash back. This is because when you return any product, the store would treat that as a fresh purchase, not routed through them and so you lose your cash back. It is also recommended that you double check and ensure that you are getting a good deal. At times, you may find another website offering a better price. Obtaining cash back from Ebates may not compensate for that price difference. It doesn’t really justify paying more for getting a bit of cash back. You won’t really save in such circumstances. It doesn’t cost you anything to sign up for Ebates. If you buy items that you would really need, it’s worth using this site. All that you need doing before making any purchase, is to visit the site and look for the store you want to deal with, make your purchase and it’s all done! In case you frequently order goods online, you’ll find Ebates helpful for buying items that you need regularly. You get rewarded for doing online shopping and you won’t even require a credit card.